Def Leppard played show 48 of their 2014 tour dates last night in Temecula, CA and here are the setlist statistics. The show took place at Pechanga Theater at Pechanga Resort and Casino with 16 full songs played. View all the stats below after all 48 full shows played in 2014. No more shows are planned in 2014. 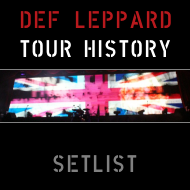 18 full songs played and one snippet throughout the 2014 tour in USA, Canada, Mexico. 3 snippets/partial songs played as a medley in London during the one-off NFL performance. 14 songs were played at every full show. 'Rocket' was not played in Los Angeles and Phoenix due to Vivian's health issues. 'TLFL', 'Promises', 'MLLAM' and 'Action' were added into the show for the last 6 shows in Mexico and the private/casino dates in the USA. All 16 songs performed last night were played in Temecula for the very first time. 18 songs played from five studio albums/one compilation album.